We want to hear from you! Email Touch Wellness at info@touchwellness.com or use the form below to contact us regarding any information you may want, questions you may have or schedule a phone call with our team. Of course, you are welcome to call us directly at 415-564-1103. We respond to emails within 24 – 48 hours of receipt, Monday through Friday. What is the general topic of this email? 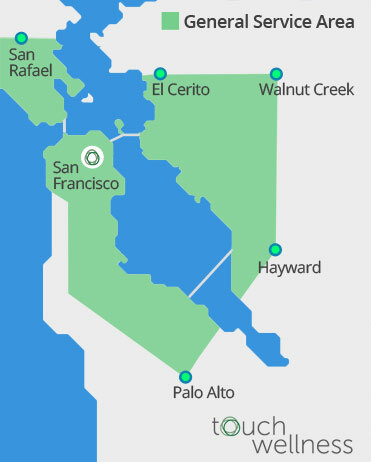 Our service area for the Wellness Program is loosely defined by the green shaded area below and bounded by the cities indicated. Please contact us using the form to the left to see if we can provide our services to your business.